Now I live in Vermont, which is one of the most beautiful and inspirational places you can imagine. I get inspiration, literally out my back yard, or in the woods behind my house. 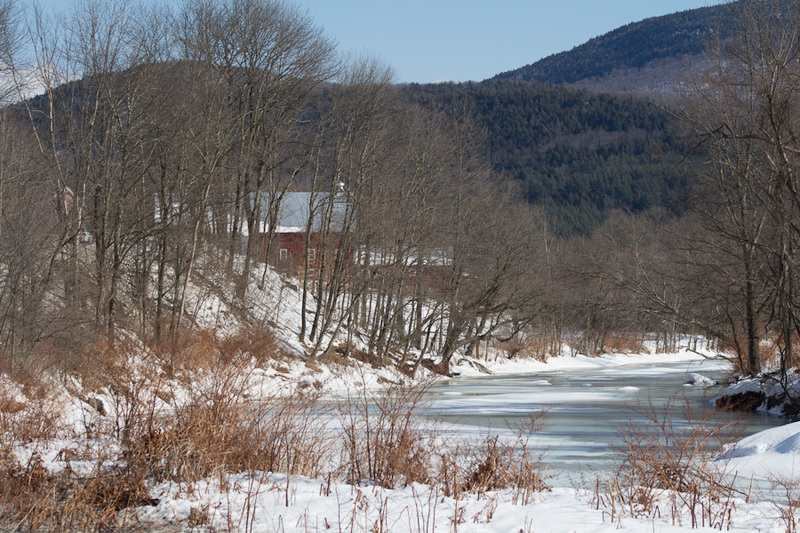 I find inspiration within minutes drive from here, at Indian Brook Reservoir or Mills River Park, or the roads around Jericho and Underhill with their magnificent views of Mount Mansfield. So there is seldom a day that goes by that I can’t find or see something that makes me wish I had my camera, or paint brushes. Today stands out as different. To begin, the day was already off to a great start as I was delivering a painting, “Winter Birch Forest I, with Chickadees” to its new owners. Wonderful people! And delivering a replacement painting (“Winter Birch Forest II“) to hang where this one came down, at the Mad River Barn Inn & Restaurant in Waitsfield. So already it was a good day. Barn on the River viewed through the trees. Looks like a painting waiting to happen to me! 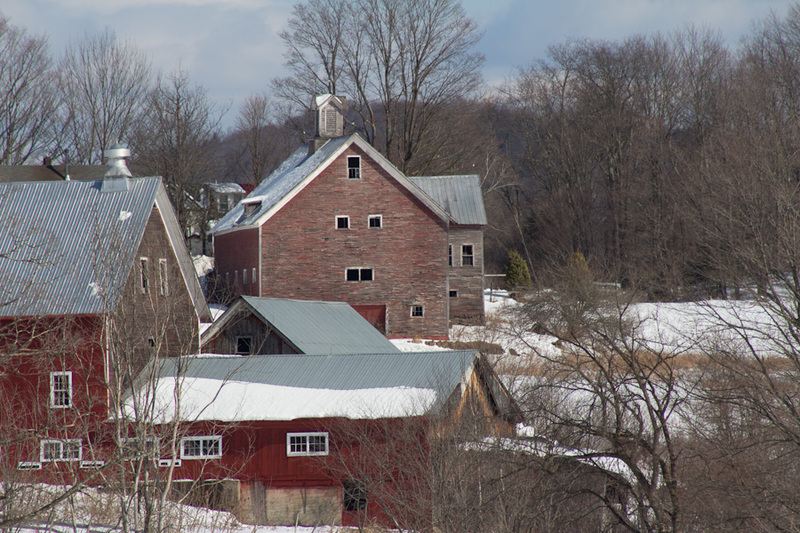 Waitsfield and Warren, in Vermont’s Mad River Valley, are some of the most inspirational towns I know. And I hardly know them. There are barns, and fields, fences and trees, and streams and rivers, and mountains, and… well, you get the picture. 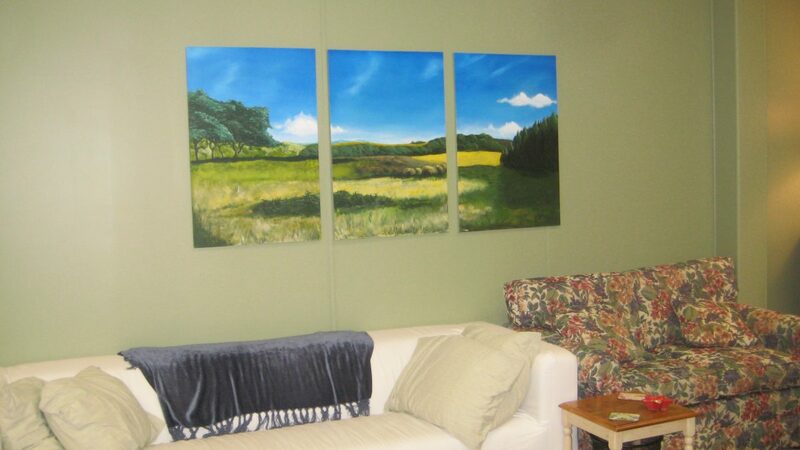 I have had my eye on a couple of barns along route 100 for a while now as possible paintings. I’ve taken pictures in the past, for reference, but never in good light/weather. So today was a perfect day to visit them again and get better photos.